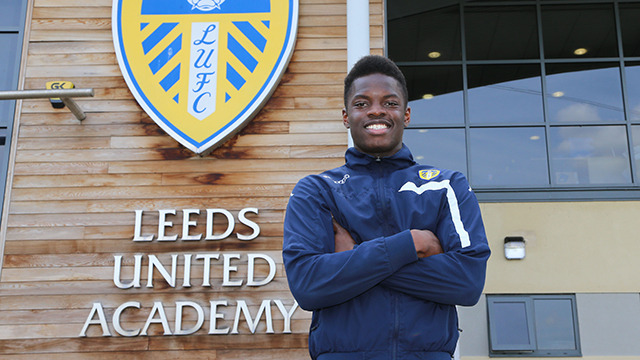 We are delighted to confirm that young midfielder Ronaldo Vieira has agreed his first professional contract with Leeds United. The 17-year-old Academy prospect has penned a two-year deal at Elland Road, which will come into play on July 1, after initially joining the club on scholarship terms at the start of the season. Vieira, who arrived from York’s i2i Football Academy, has featured regularly for United’s youth teams during the current campaign, making 13 appearances for the Under-21s and 25 for the Under-18s. The Guinea-Bissau-born central midfielder is the first of a number of young players set to extend their stays at the club over the summer. “I’m delighted, I’m over the moon with it,” Vieira told leedsunited.com shortly after putting pen to paper on his professional deal at Thorp Arch on Thursday afternoon. “It’s been a great season for me and I’ve worked hard for it. It’s great to get rewarded with this. “I first found out just over a month ago. I got called into the office and I was offered a new two-year deal – I couldn’t stop smiling. It felt great. “I want to thank all of the staff at the club for developing me and also my i2i coaches and all the staff there who have supported me throughout. “When I signed my scholarship, I knew Leeds was a good opportunity for me because of the amount of players that have gone from the Academy to the first team. “Now that I’ve signed a new deal, I’m looking forward to the next few years and seeing how it goes. Vieira joined the club on scholarship terms last September following a successful trial and initially found his feet with the U18s before progressing to link up with the U21s towards the back end of the campaign. “I started the season playing with the Under-18s and I got settled in properly,” he explained. “Then I started getting into the Under-21s squad. Vieira has already had a taste of running out on the hallowed turf at Elland Road, having starred for the U18s in their FA Youth Cup tie with Manchester City before featuring there with the U21s in a handful of league fixtures.